Capsicums are beautifully colored fruits that are named differently according to where it comes from. In Britain, they are called chilli peppers, red or green pepper (by the color) or sweet pepper. In US and Canada, they are called bell peppers. In Australia and Asia, they are known as capsicum; and in some countries they are even called paprika (where paprika powder is derived from). Cayenne and jalapeno are the “hotter” versions. Capsicums come in a variety of colors: Green and purple are more pungent and taste slightly bitter. Red, orange and yellow are milder flavored, sweeter, and pleasant to the taste. The red peppers are really green peppers which have been left to ripen on the vine. So green is simply the unripe version of the red. Botanically, capsicums or bell peppers are fruits as they have seeds. However, they are widely used for cooking, so culinary-wise, they are accepted as a vegetable. The stronger the color of the bell peppers, the higher the concentration level of antioxidants. A small bell pepper could provide up to three times more of the recommended daily amount of vitamin C, much more than any citrus food. Each color of the bell peppers have different phytochemicals and provide different nutrients. Consumption of the variety of the colored peppers are recommended in order to benefit from all the nutrients. Please refer to the Phytonutrients page for the benefits of each of the phytonutrients mentioned above. Bell peppers have very high content of vitamin A, C and E (all antioxidants) that help to effectively neutralize free radicals. Antioxidants protects the body from carcinogenic and toxic substances. Just by this virtue alone, it is a good remedy for many health problems. This fruit also has almost the whole range of vitamin B complex (B1, B2, B3, B5, B6 and B9). Other minerals are potassium, manganese, thiamine, molybdenum, trytophan, copper, cobalt and zinc. Capsicums have been used for its medicinal values since ancient times but have only recently been documented by medical science. And what research has found are remarkable healing virtues. Bell pepper, or capsicum, is one of the most nutrient-dense foods available. By itself, capsicum has so many healing properties, but when taken together with other herbs, fruits and vegetables, the nutrients absorption are multiplied hundredfold. Anti-bacterial and anti-fungal: The anti-septic properties in capsicum makes it effective in fighting food poisoning. Coupled with a good supply of probiotics, yeast and fungal infection problems, like ring-worm, shingles, athlete’s foot, etc. can be easily eliminated. Anti-aging: We all know that antioxidant is highly effective in helping to protect the skin from free radical damage known to cause signs of aging. Blood clots, prevent: The very high content of vitamin C in capsicum makes it very effective in preventing blood clot, thus preventing strokes. Cancer, prevent: All the colored capsicums contain very high antioxidant and phytonutrients that are especially helpful in preventing cancers of the bladder, cervix, pancreas and prostate. Cholesterol: These colorful juices can significantly help to reduce cholesterol. The concentrated antioxidant fights oxidative stress that is the main culprit in oxidizing the LDLs in our blood. In the process, it also retards the development of atherosclerosis (hardening of the arteries) and lower blood pressure. Cold feet: During the winter when you have cold feet, cut up capsicum and put them in the socks. The mild “hot” will help keep your feet nicely warm. Digestive system: Capsicum is a stimulant herb. It helps relieve gastrointestinal problems like indigestion, stomach ulcers, colic, dyspepsia, diarrhea and even help reduce excessive flatulence. Immune system: The strong content of vitamin C stimulates white cells to fight infection, naturally building a good immune system. Metabolism, enhanced: Increases our body metabolism by lowering triglycerides which are stored in our body fats. This helps to burn calories more effectively. Nose bleeding: The rich vitamin C helps to heal, repair, build/strengthen the lining of the mucous membranes to prevent nose bleeds. Mix capsicum juice with lotus root juice for better effect. Optical system: The high vitamin C and beta-carotene makes capsicums especially beneficial in preventing eye problems like astigmatism, cataracts and macular degeneration. Pain relief: Capsaicin in capsicum blocks transmission of pain, so it can help relieve pain to a certain degree. It is also effective for eliminating headaches and migraines. Respiratory problems: The high level of vitamin C coupled with flavonoids make capsicum a very good food that helps prevent respiratory problems like asthma, emphysema, wheezing, lung infections, etc. Sore throat: Gargle some capsicum juice to help eliminate a sore throat. The anti-septic properties does the work super well. 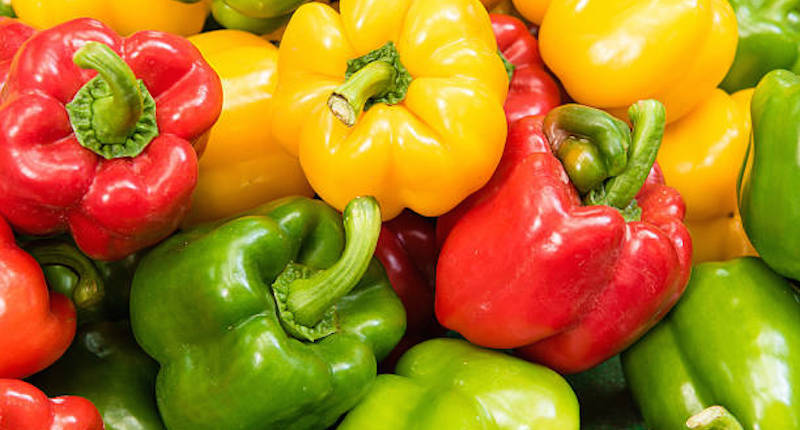 When choosing to buy bell peppers, choose those that have firm, smooth skin without any wrinkles. The stem should be fresh and green. The fruit, even though hollow, should feel heavy for its size. Avoid those that are sunken or have black spots. Store bell peppers in a plastic bag in the fridge. It will stay fresh for up to a week. Wash only when you need to use it. The green peppers being the unripe version of the red, will last longer, though it will not turn color anymore. Add finely chopped bell peppers generously in your salad, casseroles, and other cooking. When juicing bell peppers or capsicums for any remedy use as above, squeeze in lemon juice to taste. Capsicum juice by itself can taste rather “sharp”. Lemon juice helps “blunt” the taste and makes it flavorful. diet. I am very happy now that I am losing weight. I have made my daily office lunch (Mondays to Fridays) salad with green, yellow and red capsicums together with a carrot and beet, duly seasoned with an amla, a green chill and a bit of ginger. Extremely good for lowering BP and absolutely no constipation.